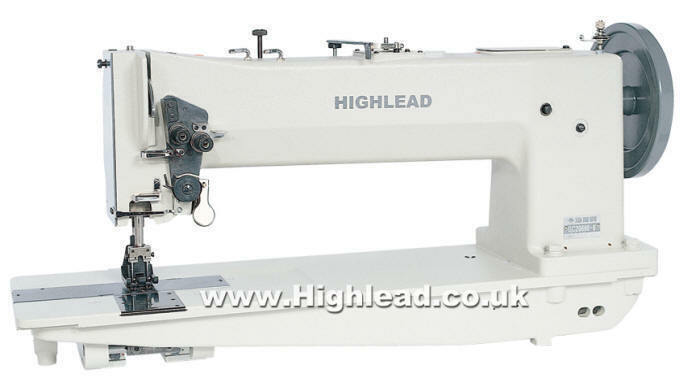 The Highlead GC20698-5 (single needle) & GC20698-6 (twin needle) are extra heavy duty long arm flatbed machines for sewing heavy & extra heavy weight materials. The long arm flat bed allows 508mm* (20") clearance to the right of the needle, which is approximately twice the length of a standard machine arm, and has a high under arm clearance of 145mm. 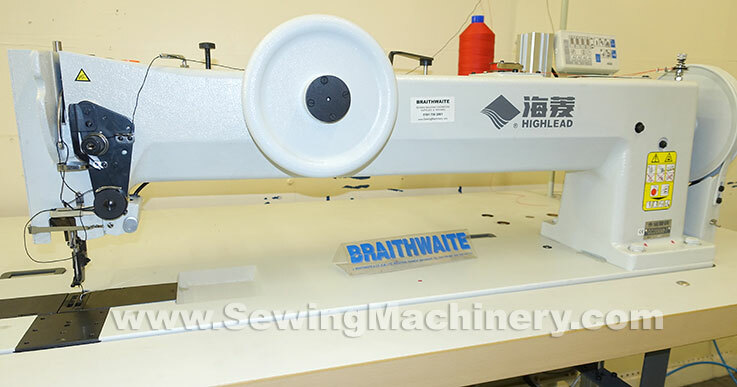 It features a triple feeding action by way of: bottom feed, needle feed & walking foot top feed and is fitted with extra large vertical axis hook(s) for use with thick heavy duty sewing threads. A high foot lift of up-to 28mm* allows many different types of heavy or bulky items to be stitched. Sewing applications include extra heavy stitching of canvas, vinyl, leather, wedding, laminated materials, coated fabrics, tents, tarpaulins, awnings, lorry side covers, material structures, covers and many other heavy or bulky items. To make operating "user friendly" it is recommended that this model be fitted with an electronic needle position motor, air assisted reverse device and air operated automatic foot lifter device. Long arm, 508mm* (approx. 20") clearance. Heavy Duty Triple feeding action. Extra Large vertical axis hook & base. Extra heavy long arm version. Electronic motor with automatic needle position. Automatic air operated foot lifter unit. Stitch program control input panel. 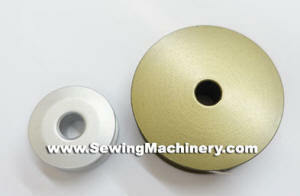 Normal sized industrial sewing machine bobbin in comparison with the Extra large GC20698-5/6 bobbin. For fewer bobbin changes and of particular use when using the thick sewing threads associated with extra heavy materials.